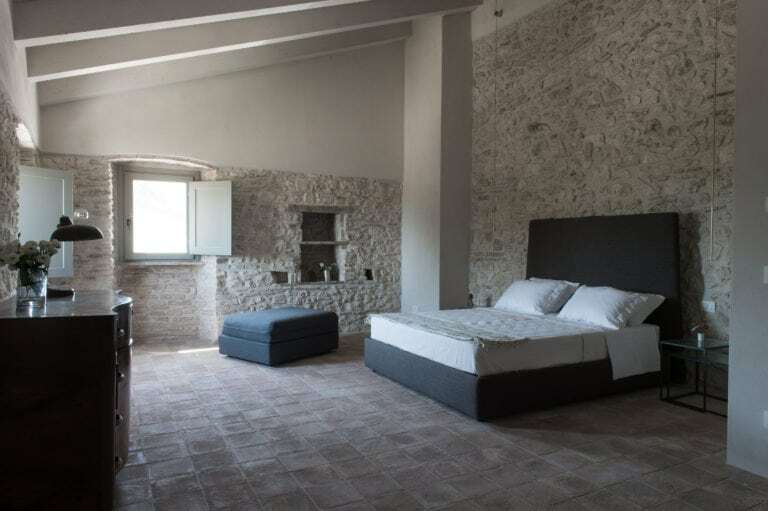 Casale Valigi endeavours to preserve the atmosphere and warmth of the old country house intact. There are six classic, superior rooms and suites. They are all furnished according to the style of the building. All the rooms have a natural foam mattress with aloe vera. The pillows with organic spelt husks help to massage neck and shoulder area as you lie on them. The light rustling of seeds and freshly harvested hay fragrance encourage a peaceful rest. All the fabrics are handloom and hand woven as per ancient local traditions for the bliss of a fresh and reinvigorating sleep. Our linens are scented with essential oils. Remodelled objects and modern touches complete the furnishing of the rooms. For our courtesy products we have chosen the natural products. The inside areas and outside common areas of the building are for our guests to meet, enjoy and share. Here they can enjoy the pleasure of a home-made breakfast, a good book and rediscover the quiet and peaceful conviviality of times long gone by. A charming double room. A large bed where reflections of light and shadows render the atmosphere unique and romantic. As regards the furniture, 1950s chests of drawers are harmoniously mixed with Antique 19th Century sofas.The bathroom area is separated from the washbasin area, giving guests privacy and a noteworthy corner. It is possible to add a single bed to this room. Light enters the room giving special moments. There are porthole windows framing the sunset and overlooking the pool and the garden. 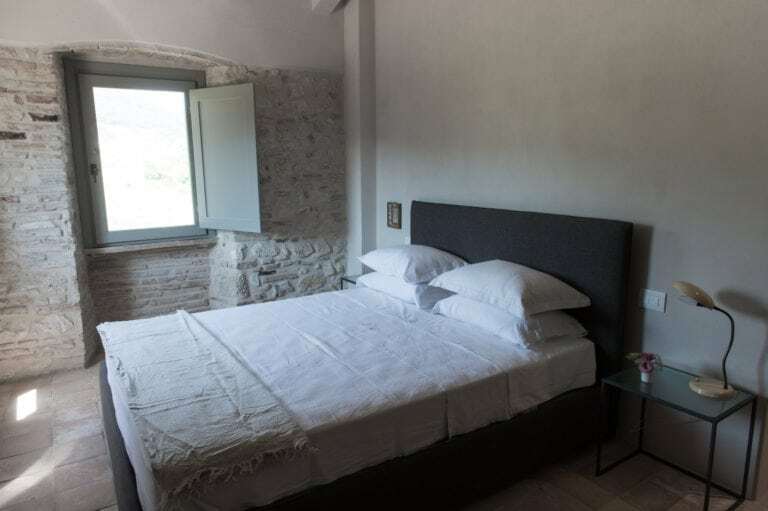 Floor to ceiling windows overlook the Rocca of Narni. The suite is on two levels. Upon entering you are welcomed into a living room furnished with pieces from the ‘50s and of baroque style. The living room is heated by a small fireplace, which is a pleasant companion during the coldest seasons. A lovely firewood holder enriches the cosy atmosphere. A large bedroom is on the upper floor and it is independent from the relaxation area. A separate bathroom serves each individual level. In this room it is possible to add a single bed. 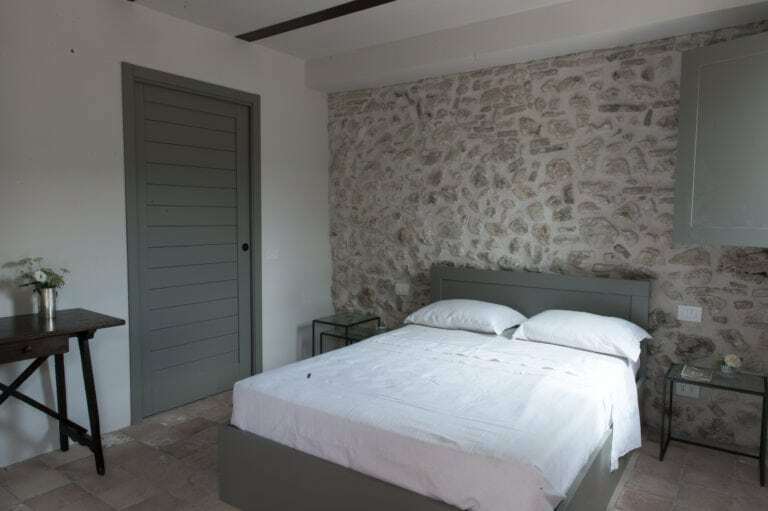 The ancient stone walls render the room cosy and welcoming. The furniture is intentionally essential, of a Franciscan style; from the vintage desk to the stone niche holding the most beloved books. There is no shortage of contemporary touches with mirrors and a shower in stone and glass. 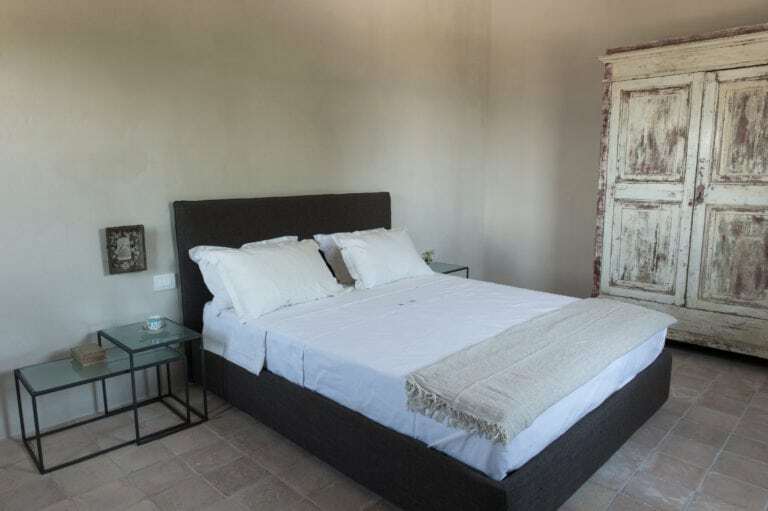 One of the rooms located on the ground floor has an automatic direct access to the garden.It is equipped with accessibility and disability facilities. 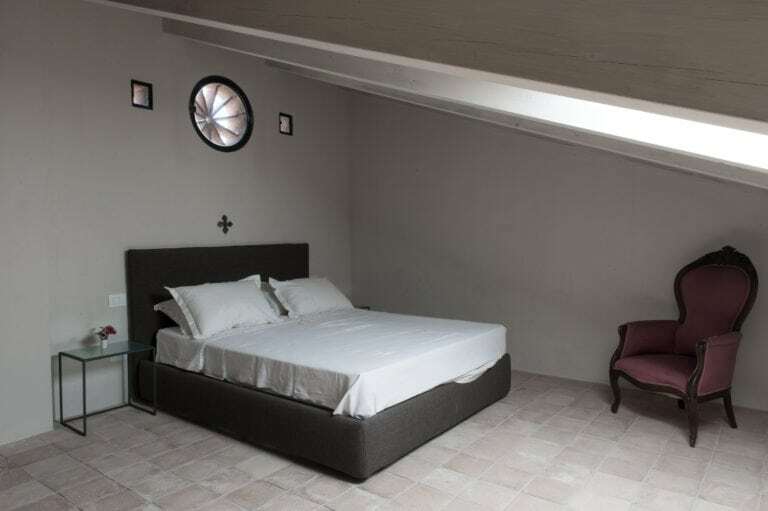 The furnishings are intentionally simple with a Franciscan style. There is a writing desk and a wardrobe from our peasant Umbrian culture. However, there is no lack of details to pamper the customer.